Palmer amaranth has been identified in newly-seeded conservation plantings in more than 30 Iowa counties, and we would not be surprised if the actual number is double that. The number of Palmer amaranth plants per acre has typically been low enough (<250 plants per acre) to make physical removal feasible in smaller fields. Where hand removal was ruled out, mowing was the recommended control option. Mowing does not kill most Palmer amaranth plants, but it is an effective way to reduce seed production, especially if initiated early in the season as recommended when establishing native plants (Figure 1). Figure 1. Regrowth on Palmer amaranth following mid-season mowing in newly-seeded conservation planting. While mowing can be an effective management tool, it is too late now to be of any benefit. Most seed on Palmer amaranth plants will be mature, thus seed production will not be reduced with mowing at this time. An even better reason to stop mowing is the high likelihood of the mowing equipment transporting seed outside of the infested field. 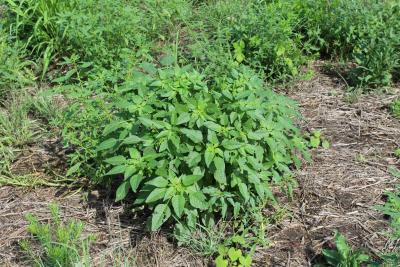 The primary concern with the Palmer amaranth in conservation plantings is that the weed will move into adjacent crop fields where it is better adapted for survival. The goal now should be to minimize the threat of seed movement out of infested fields. Avoid mowing and minimize traffic through infested fields to confine the seed to the infested field. Next year, regular mowing should be used to reduce the productivity of returning Palmer amaranth.